I have not yet come to a conclusion about what this blog is about. However, after a week in South Korea, I do know a bit better what it is not about. My experience in only one week has been so full, it would stretch my ability as a writer to try to do any kind of justice to it. This would be true, even if I had limitless time to write, and thought my readers had limitless attention spans. Yet, because this is a blog, I want to write short posts, and -- for the most part -- do this relatively quickly. So, I have come to a rather obvious conclusion: I will not be able to communicate the richness and variety of my experience to you in this blog. 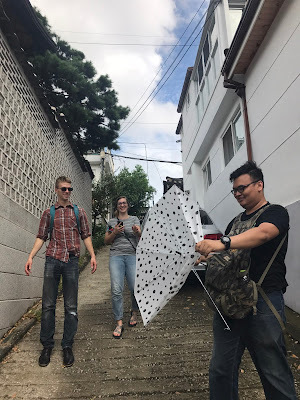 At the same time, since I have not yet figured out what else this blog could be possibly be about, I will try to capture a bit of what my experience has been, as best I can. I arrived in Incheon Airport, near Seoul, last Friday night with Allison, my friend from Virginia and fellow MCC volunteer. At the airport, I met Dante, the volunteer from Indonesia who will be with me at the Dandelion Community. We were greeted by MCC staff, and fell asleep on the three hour bus ride to Chuncheon, where the MCC office is located. 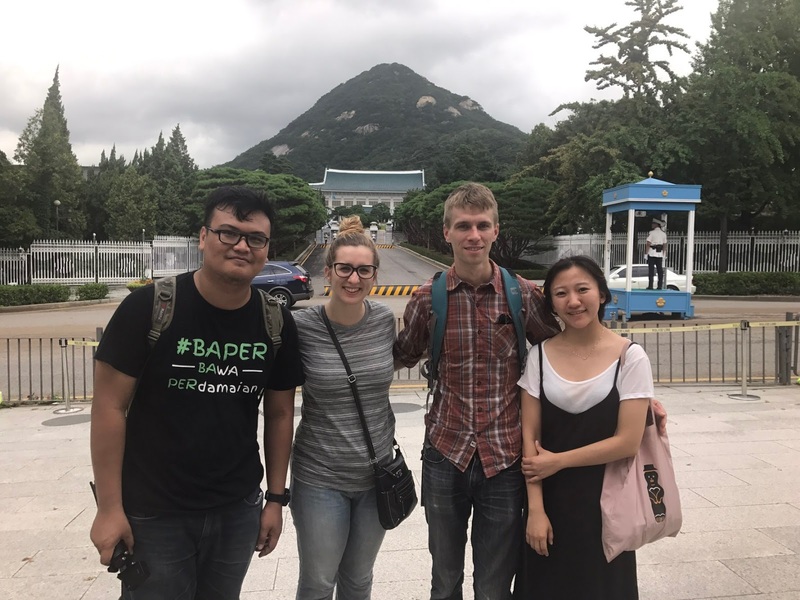 During the week, we got to know everyone in the MCC office here, and met many people from the local Anabaptist congregation. This involved going to many restaurants and eating lots of Korean food. We also had sessions throughout the week about Korean culture, language and history, as well as MCC's work on the Korean peninsula. Dante and I will be leaving for the Dandelion Community on Monday. Allison is going to another placement in South Korea tomorrow. It is Sunday evening and the sun had gone down. 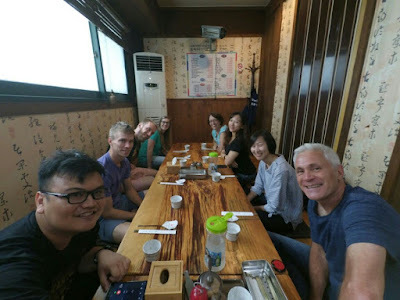 Allison, Dante and I had just gone out for dinner with Dongyu, a founding member of the Anabaptist church that we attended in the morning, as well as a well-known citizen of Chuncheon and university professor. 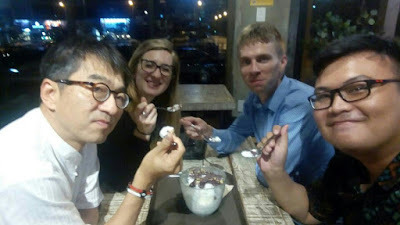 He treated us to Chuncheon's famous Dakkalbi, a delicious chicken rib dish, and Patbingsu, a red bean shaved ice dessert. Dongyu had dropped me off at a place I did not recognize. 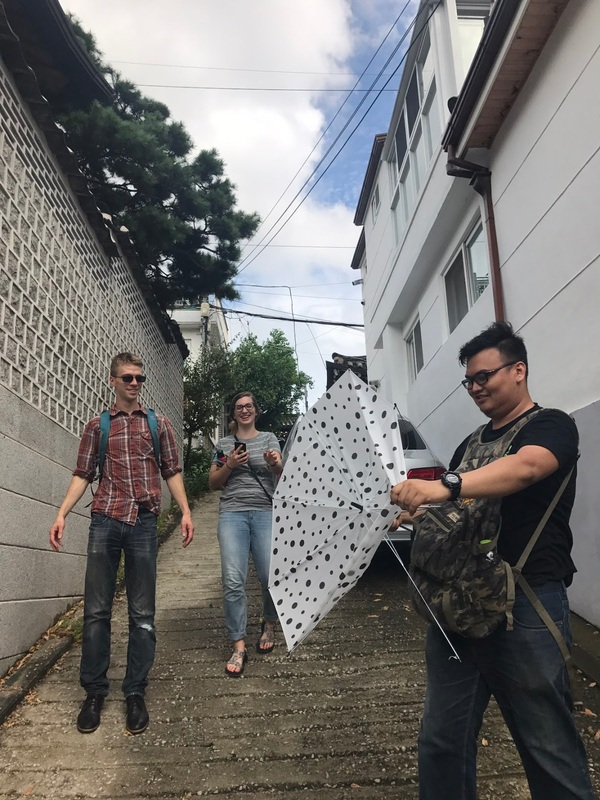 I knew it was the wrong place when he dropped me off, but I had heard that in Korean culture publicly contradicting elders is not respectful. I thought the right place would be near by, so I didn't make a fuss. I soon found, however, that it was not nearby. First, I tried talking in Korean to the nearby security guard. Somehow, the security guard concluded from my use of the Korean language on that occasion that I would be able to understand him only if he spoke veerrry sloooowwwly. That turned out to be optimistic of him. I am nevertheless sometimes overcome by an irrational self-confidence (and the streets here are very safe). So, I was not worried. I did recognize one road, and after phoning one of our MCC reps (whose apartment I am staying at), was able to make my way back. Allison, Dante, Solger and I were visiting Seoul together. Solger is the same above-mentioned MCCer. We had been to a memorial for the Sewol Ferry, a protest for comfort women at the Japanese Embassy, a palace from the Joseon dynasty (1392-1897) called "Gyeongbokgung," and closer to South Korea's executive government building, called "Chongwadei" or "The Blue House," than Solger had ever been. After dinner, we decided to stay in Seoul a little longer than planned. 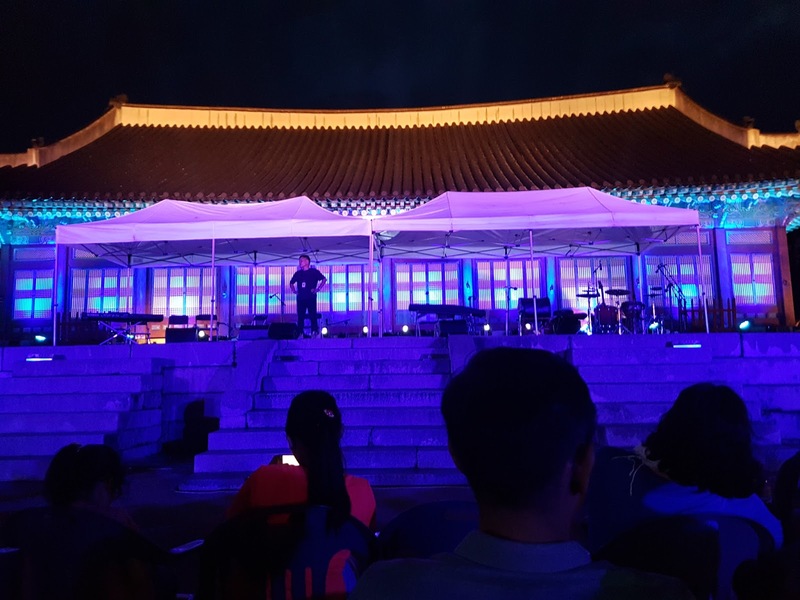 Solger had never been to Gyeongbokgung at night. Only foreigners are permitted to buy tickets at the gate. Moreover, they require one of the foreigners in a group of four to have a passport with them. Dante had brought his passport, and so we decided to take the opportunity to see the palace at night. 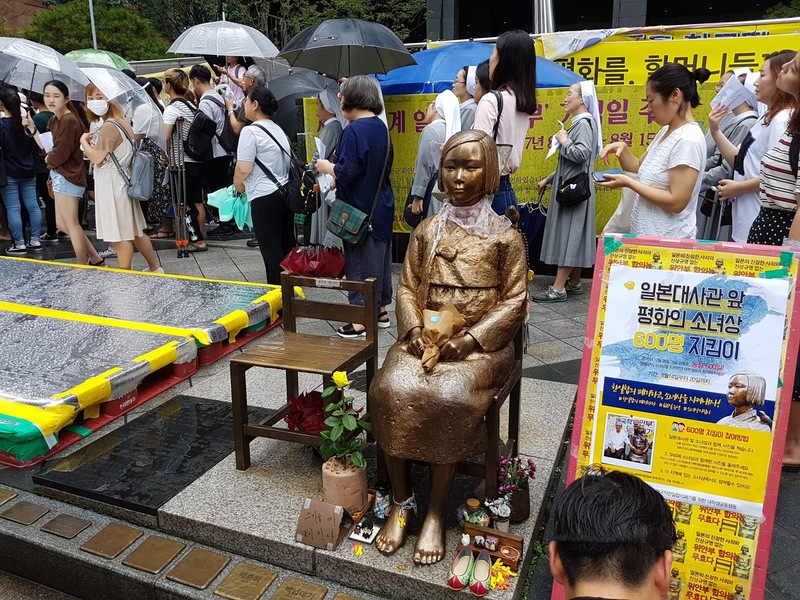 When we got inside, we saw instruments and chairs set up outside Sujeongjeon Hall. 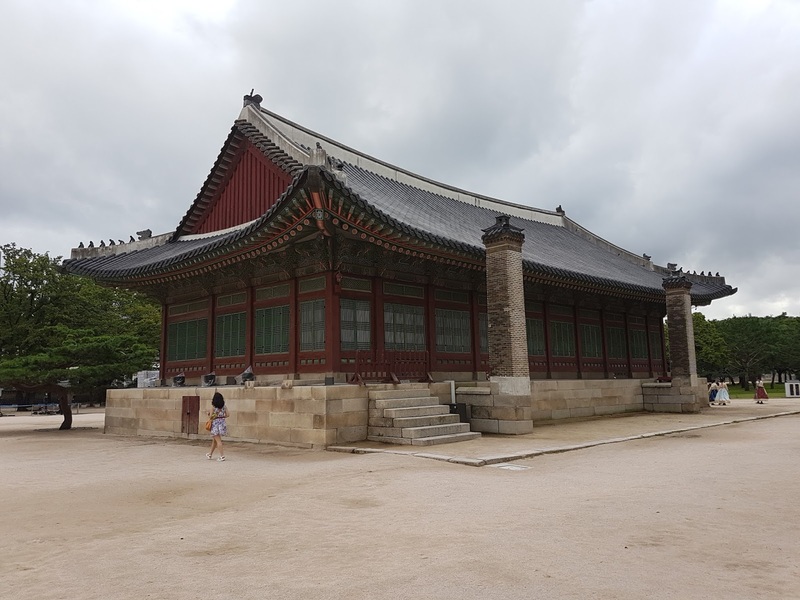 Sujeongjeon Hall is the place where the Korean alphabet and writing system, called "Hangul," was created. This was a very significant achievement in Korean history. Hangul, which is phonetic and easily learnt, was created to bring literacy to the common people of Korea. 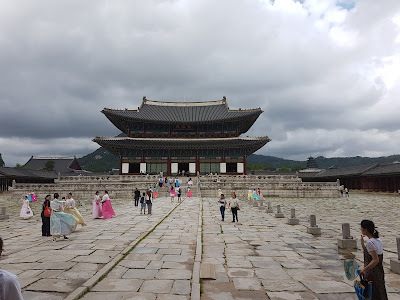 Because of the work accomplished in this building, it took me only a few hours to start learning how to sound out written Korean words, rather than spending my life learning Chinese characters. It was in front of this building that we watched a concert featuring, among other things, traditional Korean music, dancing, and a paly paly (very fast!) electric violin version of Vivaldi's four seasons. It kept raining sporadically, twice or thrice turning into a downpour. So, every five minutes or so, we, along with everyone in the seating area, would huddle under our umbrellas, and then close them all again as the rain stopped. It was something special. Wow! Sounds so interesting already! I love how your visit is opening the world for a local as much as your world is expanding! Thanks Heidi, it has been very world expanding for sure. Great stories, great memories. I can't wait to read more in the future. This was fun to read, Robert! We are missing you around the apartment. 😊 Hope your first days at Dandelion are going well. Praying for you! Thanks Donna! You and Chris will be in my prayers as well. Dante and I are doing well I think, beginning to make connections and find our place here. Thank you. Sorry, I didn't create my mailing list in a systematic way. You should be added from now on.